You should also know that these past two days we have been in NYC and we have walked and walked and walked some more. I was absolutely worn out so what am I doing at the end of the day? Drinking coffee and blogging. Ha! It's quiet relaxing. Today around NYC and especially around The Statue of Liberty I saw people taking a crazy amount of selfies! I decided I would capture by camera as many people as I could taking a selfie. Did you know they make monopods you can attach your phone to? AKA - 'selfie pole' (I created that name) People were walking all around extending this big pole with their cell phone on it capturing their beautiful image. I'm sure they soaked up all the history. Here is one I snapped. Pretty awesome, right? Ok! So who else has tracked a trip by the numbers? ha! Selfie pole? Hilarious. And kind of practical, but then does it condense into something you can put in your purse? Cuz that would be annoying to carry around. It's not a bad idea even if it does look funny. Sounds like you're having fun! It could always double as a self defense pole... but I'm sure it breaks down. Love that your tracking everything and writing everything. I can't wait to read more about it. I have seen a ton of people with the "selfie stick". At first I laugh but then in terms of making videos, it would come in handy. aha. i have never seen those selfie poles but that is so funny!!! Haha, I love that you included naps in the numbers! :) I mentally track a trip by numbers, but mainly time (since bus traveling is slow in Peru) and money (so we stick to a budget!)... it's a fun idea though when traveling! Been enjoying your posts on Instagram! You two are cracking me up! I think it does extend out and then condenses into about 5" so you can put it in your purse. I still can hardly believe the selfie pole but I do think it is practical. I need to start writing up posts about our trip because I have a zillion things to share. I have no idea how I'm going to condense it down but I will somehow. 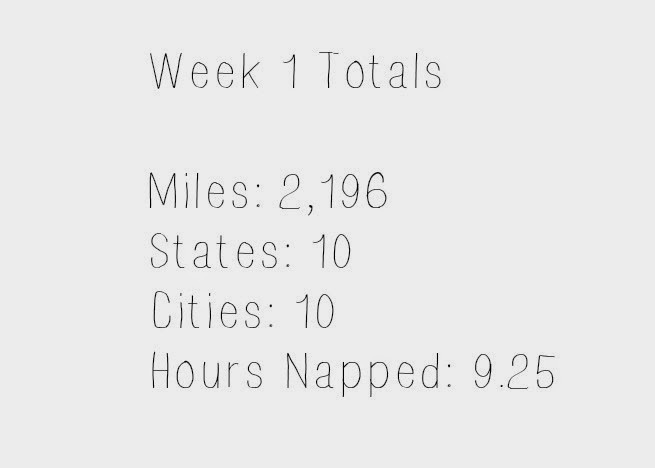 It was a lot of miles! Fun but I was getting tired of being in the car. I had never seen those selfie poles either but they are pretty darn funny and practical. The naps! 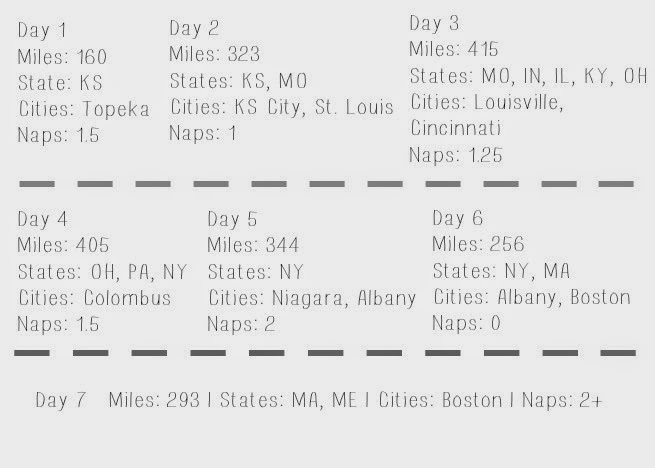 I nap all the time in cars so I figured I should track it. It went down significantly the second week. I think it is was because we were in East cost traffic and it was crazy. You aren't the only person who has told me they want that selfie pole. I guess it could come in really handy.